Apparently Europe has been dealing with this issue longer than we have; many of the best gluten free products are imports from Italy where they are very aware of celiac disease (CD) according to several of my gluten sensitive (GSD) friends who have traveled and eaten there. Another friend said it was easy to eat gluten free in London. I noticed that I could click on the rs numbers in blue to get to the raw data page where it would show me more detail like the physicl location on chromosome 6. There I saw that I had only one copy of each of these variants as already indicated on this initial page. Next I checked my dad’s results as well. He has one copy of each of the same variants that I do. Checked my maternal aunts, since my mother was never tested, no variants for Aunt S and one variant for Aunt T. My brother who has severe congestion issues also has two variants but both of his are for just the HLA-DQ2.5 haplotype – one from each parent! Two of my Hordaland Norway third and fifth cousins have just one of that variant while several others have none. I checked my Ancestry DNA results as well by opening the raw data in a spreadsheet program and doing a search for first rs2187668 (C/C is normal) then rs7454108 (T/T is normal). Yes they are both T/C – no error. You can do this search in any company’s results but these SNPs may not be tested by everyone. Convinced that there might really be a genetic reason for my gluten issue I have chosen to continue my eating experiment. I have ordered various gluten free breads and noodles from Amazon . I like rice noodles anyway and look forward to making my peanut sauce Thai dishes more often. So far the breads are not as nutty and delicious as my favorite gluten rich types, but I will manage. 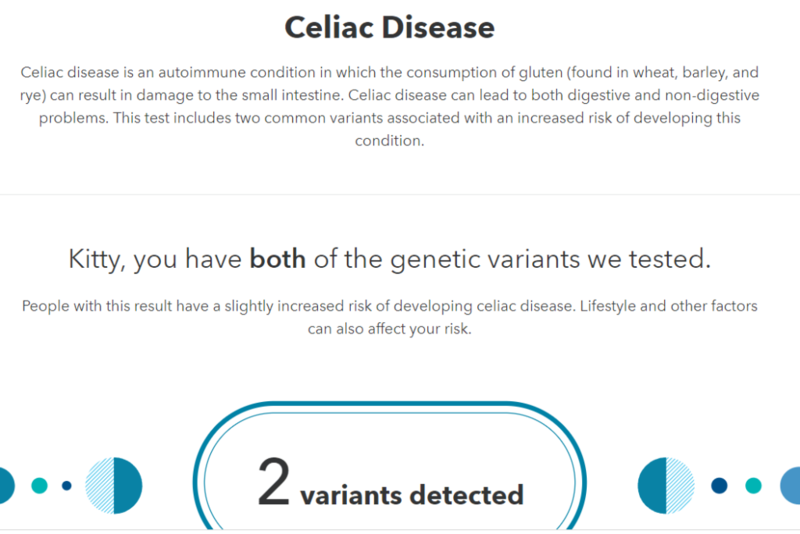 23andme cites this article – Celiac Disease and Nonceliac Gluten Sensitivity: A Review. Be sure to use a gluten free baking powder! Both the genes I have and I have celiac disease. Ever since I was a child, I had a lot of trouble with my stomach. The doctor told me I had a nervous stomach. So, as a retiree, my doctor discovered gluten allergy. I did not have a single bowel duct in my stomach. Then I also had wounds in the stomach and two in the esophagus. Every morning I was as sick as a pregnant woman. When I was pregnant I was always sick in both in the evening and in the mornings. Sometimes I think that if this had been discovered before, the kids would get better conditions during pregnancy. They were so small when they were born, and I used regular small size clothes. I’ve gotten better after getting gluten free food. 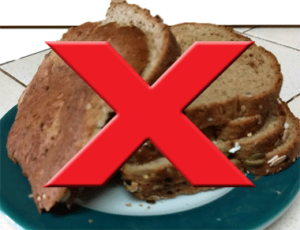 Restaurants say they have gluten-free, and then they often say it’s on the Menu (the list), but they do not have it. Otherwise, oats from the USA are very ok together with lactose-free milk. Now we have got ice cream on sticks in Norway that tastes very good, they are Gluten Free and Lactose Free. I have the same result presented to me by 23&me in the last 3 months. Promethease.com told me about this condition 6 months ago. I have given medical genetic workups I’ve done on Promethease by summary 4 to 2 and by disease (I analyzed about 9 different problems – HBP, Cholestrol, Celiac, etc. My interest was amazed and we use updated reports whenever I do an update. There are things we are “watching.” My interest also took my complaint about being anxious, she looked down the new summary saw that I metabolize caffeine slowly. She asked how many cups of coffee/day I drank. I said 4-6 cup. She said go to 1 cup and drink decaf green tea the rest of the day – reduce anxiety and tea is high in antioxidants! I did/do that and my anxiety is reduced! I love my coffee but as a slow metabilizer I never drink it after noon, my 3-4 cups are all half decaf! My celiac was diagnosed with genes, one donated from each parent (by a lab in Texas before I got into genetic genealogy). After going GF in 2007, I no longer have sinus infections nor migraines. Celiac also caused early osteoporosis as my levels of vitamin D3 were severely low and thus little to no calcium could be processed. After bringing that back up to normal, the deep bone pain and chronic nosebleeds disappeared. I had no idea what was causing them. Celiac is often called the “great pretender” as there is a multitude of symptoms or conditions caused by deficiencies due to malabsorption and people don’t realize it. I’m glad you got it figured out, Kitty. There is no going back as untreated celiac can cause cancers in the GI tract and there is no reason to let that happen! I do not have CD, but am gluten intolerant. 12 years of problems before I discovered that my symptoms were similar to gluten intolerance. I tried going gluten free and though I look at cheese danish with envy, it is not worth how ‘ill’ I get when I have even a crumb of wheat flour. It is easy to live with at home, once you get used to it. Eating out is much more of a problem. My tip: ALWAYS say you are ALLERGIC to wheat, and they will take you much more seriously. Watch out for hidden sources, like flour encrusted french fries, and SOY SAUCE. Pot lucks are the worst — you can never find the person who brought the food to ask what is in it. When going to someone’s house, offer to bring your own gluten free bread and crackers — so simple, and it alleviates so much hostess hassle! In San Diego area, try the Canyon Bakehouse breads — they are the best by far, especially their bagels and rye bread. Bean curd noodles are a great substitute for spaghetti. Good luck, Kitty. So sorry for your loss Steve. I weighed 27 pounds when I was 5-years-old – and I was always famished. Went on a gluten-free diet in 1974. Been gluten-free since then. My mother and my daughter and several other females in the family have had problems with gluten. No problem on the male side. I get my gluten-free bread from a Florida bakery via my local health food store. You mention problems with caffeinated coffee. I am one of the opposites with coffee. I can drink caffeinated coffee any time of the day or night and not have any problem sleeping. I stumbled onto my gluten sensitivity in about 1990 when I did a eight hour fasting glucose tolerance test. Throughout the fasting day I was amazed how clear my thinking became and my nasal congestion diminished. After the completion of the fasting test, I eagerly targeted the local sandwich shop. Within 10 minutes of finishing the sourdough and tuna sandwich, my mental fogginess and stuffy nose returned. The light bulb comes on! Why not eliminate bread and pasta for a few days to see how I feel? The mini experiment left me feeling I felt so much better without wheat in my diet. Periodically I’ve retested my hypothesis with the same onset of brain fog and congestion. I haven’t yet looked into the genes mentioned above but it wouldn’t change my mind about my body’s undeniable reaction to wheat. FYI Healthy Creations Restaurant in Encinitas, CA bakes their own versions of delicious GF bread in addition to having a completely GF menu. Great find! Thank you all so much for sharing your experiences. I apologize for all the bad thoughts I ever had about this “fad,” which I now know is real for so many. I have notified my entire extended family of their genetic standing and suggested that they all try the experiment of going gluten free for a week and seeing what it does for them. I’ve been having sinus congestion, causing pain behind my eyes, and migraines. I checked the SNPs you mentioned and sure enough one is normal, one is not. My Mom was diagnosed with Celiac decades ago. I checked and we both have the same variation. Maybe it’s time for me to go completely gluten-free. 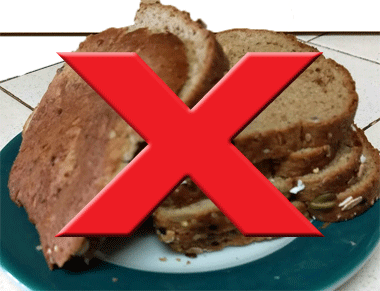 How to make gluten-free bread?